Although hyperbolic systems as such, were never pursued to completion in Germany, Dr. Ernst Kramar, working at Standard Elektrik Lorenz in 1938, developed an improved version of the American Radio Range which was able to provide multiple fixed equisignals for defining multiple routes (Elektra). After German military use early in W.W. II, Dr Kramer was asked whether he could improve it to provide directional information between the equisignals. He did so, and it was re-named Sonne, after a character from the operas. Consol is actually the name the British assigned to the system. There were also to have been other versions known as Mond (Moon) and Stern (Star) operating at other frequencies. Dr. Kramar has related how, being a devotee of Richard Strauss's music (hence Elektra), he wished to name it Salome but was overruled by the Luftwaffe. This system was installed in Norway, France and Spain as a navaid for German aircraft flying the circuitous route over the Atlantic between France and Norway, and their U-boats. It is an example of a 'collapsed' hyperbolic system wherein the baseline between the transmitting aerials is made so short that the hyperbolae degenerate into radials at a very short distance and the system becomes a bearing system rather than a hyperbolic one. 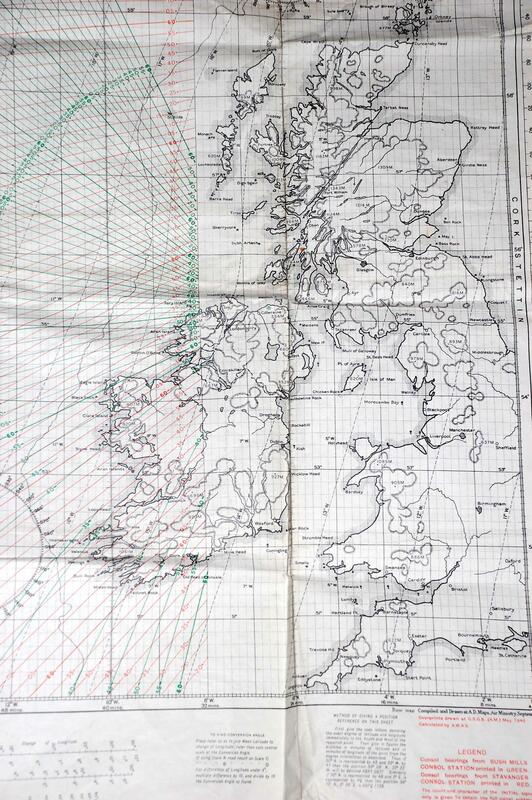 During WWII, the British captured some Sonne charts and took them to Group Capt Dickie Richardson, who was the navigation officer for Coastal Command at Northwood. Capt Richardson then found a receiver and tuned in getting a good bearing on his location. He then decided that what was good for the Germans would be good for the British. 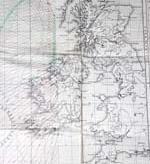 so he ordered the RAF map department to manufacture charts to British specifications. Dickie called the system CONSOL meaning "by the sun" which is described in his book "Man is Not Lost". Sonne/Consol used three aerials spaced on a line 1.5 miles long, or about three wavelengths at the operating frequency of 300 kHz. An identical signal was fed to all three aerials but at one outer aerial, it was delayed by 90 degrees of phase while at the other outer aerial it is advanced by 90 degrees. Multiple lobes with deep nulls between them were produced by the interaction of the three aerials. By steadily changing the phase shift in the two outer aerials so that it interchanged every 30 seconds, these lobes were caused to sweep. They were also switched at a very much faster rate in synchronism with a Morse pattern of dots and dashes, the effect being that each lobe carried only either dots or dashes and was replaced by its complement over the 30 second period. 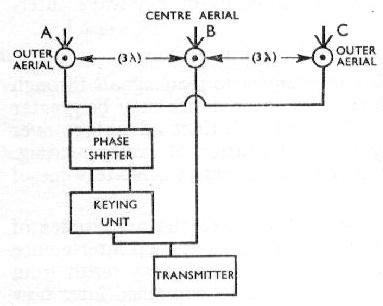 Consol ground station block diagram. The navigator only needed an ordinary radio receiver tunable to 300 kHz in order to use the system.. He heard a series of dots slowly merging into a steady tone and then becoming a series of dashes (or -dashes becoming dots). He simply had to count how many dots or dashes he could hear before the steady tone and then plot his position line on a suitably overprinted map. There were multiple ambiguities in the system since there was no inherent way of distinguishing between one lobe and another. At its narrowest each lobe, it was only about 7.5 degrees wide. They were resolved either by approximate knowledge of position or by taking a loop bearing on the station. For this purpose, a steady tone was transmitted for a few seconds before each sweep, from the central aerial only. One station did not provide a fix, of course, but it was a very useful system requiring little expertise to use and only simple equipment. "The Germans came up with a clever device that sent out a combination of dots and dashes on various bearings. By counting the number of dots and dashes transmitted in one minute (the total being always 60) a radio operator could tell the bearing of a transmitting station. For instance, if the operator heard 32 dots and 28 dashes he knew, by reference to a special Consul chart, that the station was on a bearing of 050 degrees. With two stations transmitting, a fix could be obtained using intersecting bearings or with D/F. To bomb, the Germans would determine what combination of dots and dashes, from two stations, gave the position, of, say, London, and then would fly along one line and let go when the other one gave the right count. The system had the advantages of working well at long ranges and requiring no special equipment in the aircraft other than an ordinary radio receiver. Consol had the disadvantages of not being accurate and of being susceptible to jamming. In fact, the British got so good at the latter that rather than jamming the transmissions entirely they succeeded in bending the beams, so that the Germans in turn, bombed empty fields". Consol was one of the recommended ICAO navaids after WW II. Additional transmitters were installed near New York, San Francisco, in the USSR, and in the UK (Bush Mills in Northern Ireland). RAF navigators found the system of considerable value, and it had the curious distinction of being a wartime navaid used by both sides simultaneously. There is even a story that at one time the Germans had problems with their Spanish transmitter and could not get spares to it, so the British supplied the Spanish with the necessary items in order to get the station back on the air for Coastal Command's benefit. Jose Ramon of Lugo Spain ( pop around 100,000) reports that he lives about 25 km from the Consol aerials and the station that was installed in 1941. It used Telefunken equipment and he thinks it was closed around 1984. After closure, the station was abandoned and the equipment was picked clean by those seeking parts but the antennas are still there. The Lugo Consol station was located at 43º 14´ 53.29´´ N, 7º 28´55.89´´W. Several photos of the Lugo station are available here. Consol had a range of up to 1,000 - 1,200 miles and an accuracy of bearing of around one- sixth of a degree (3 miles at 1,000 miles range). It used the principle of "collapsed hyperbolic" for operation. Consol suffered from all the usual propagational problems of these frequencies of night-time skywave and static. Station LEC located at Stavenger Norway and operating on 319 kHz, was the last Consol station to go off the air sometime after 1991. Sven Pran, LA7SG, was the project manager for Consol at "Standard Telefon og Kabelfabrik", a sister company to SEL. He adds the following " I had the pleasure of meeting Dr. Ernst Kramar while we worked on the new all-electronic construction for Consol. We first built three new stations LEX at Andøya, LJS at Bjørnøya and LMC at Jan Mayen in 1970 and then replaced the old LEC at Varhaug in 1971. Since the lobe ambiguity is greater than 7.5 degrees, you are correct in stating that the resolution is 6 counts (elements) to each degree (at best), and as there is 30 "elements" in each lobe, every second lobe starting with dots the other with dashes. The ambiguity to be resolved by other means is at least a full 10 degrees. Both the British and Germans used Sonne/Consol for navigation and that's probably the reason the stations were never destroyed except, according to Kramar, in one single case. Kramar had found a way of modifying Consol so that it gave useful signals only to the Germans but not to the British. That station, according to what I was told, was bombed and subsequently rebuilt in its original configuration and useful to both sides! The story that the RAF supplied spares for the Lugo Consol station during WWII is also true. The spares were arranged by (now) Sir Edward Fennessey, who at that time was I/C of 40 group. I visited Spain in June 1970 as a guest to the Spanish ministry dealing with Consol. The purpose was to propose a replacement system for their then worn out Consol stations in Lugo and Sevilla. As part of that trip, I also visited the Sevilla station which then operated only as a non-directional beacon for the main route to South America. I was told that Lugo had already been completely closed down by then and I believe that Sevilla closed down not long afterwards. Nothing came out of this visit. I found it most unbelievable that either of the Spanish stations could have remained operational for so many years after my visit". In Russia, a Consul station call sign KN, was located around Cape Kanin which is at the northern tip of Novaya Zemlya, It's frequency was in the vicinity of 269 or 270 kHz. There was another one, call sign RB, a bit higher in frequency located in the Far Eastern section of Russian, around Provideniya. 1) The Journal Of Navigation - Chapter 4.